Sacramento has been home to many for generations, but some fun facts remain unknown by many. From local business quirks to international statistics, Sacramento is truly an interesting place to call home. Sacramento is actually California’s sixth capital since 1854. It was the state capital in the past, was then dropped, and then, of course, is now the reigning city once again. Prior capitals include Monterey, Vallejo, Benicia, and San Jose. When Sacramento renovated the Capitol building in 1976, it was recorded as the largest restoration project in U.S. history at that time. Sacramento is actually two cities in one; a large network of tunnels remain beneath the foundation of the city. The network was abandoned when the city was raised to avoid flood damage. There are also two counties within Sacramento’s boundaries. Sacramento proper is part of Sacramento County, while West Sacramento is actually a part of Yolo County. Sacramento is home to the original Pony Express. This expansive mail delivery service originated in Sacramento and stretched all the way to Missouri. Sacramento has a prolific amount of museums. From the California State Railroad Museum to the Crocker Art Museum, there are dozens of free and admission-paid museums in the Sacramento region. The Crocker, a local downtown art museum, is the longest running art museum in the western United States. The Sacramento Jazz Festival takes place every Memorial Day weekend and has been in existence for over 40 years. Multiple cultures and socioeconomic backgrounds come together in Old Sacramento to enjoy some incredible local talent from all genres of music. The Sacramento Zoo is a historical treasure. It’s been around since 1927 and continues to delight visitors from various generations. The zoo has experienced many transitions but still plays host to the regular opportunity for school and non-profit groups to sleep over on the property and enjoy nature in the middle of the night. People love to give Sacramento nicknames. 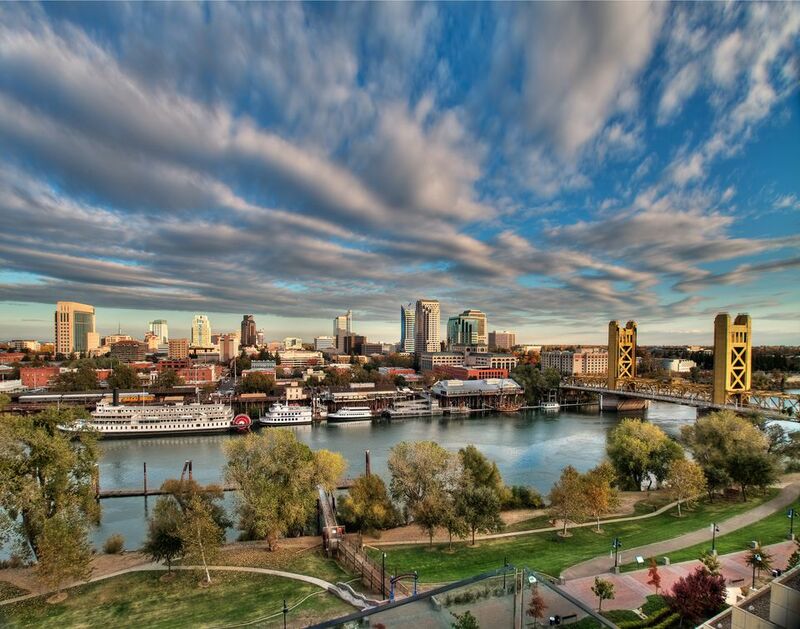 It has been called the “Camellia capital of the world,” “City of Trees” and the “River City.” These are just a few of the affectionate titles Sacramento has earned from locals and guests. Natives usually refer to it as Sactown. If you’ll be visiting Sacramento for the first time, you’ll find it best to visit in the spring or autumn. Summer weather gets as hot as 115 degrees, although temperatures rarely reach such extremes. Sacramento processes more almonds than anyone else in the world. Blue Diamond has its headquarters here, and during harvest time each year brings millions of pounds of almonds to market. Before they were the Kings, they were a semi-professional team from Rochester, NY known as The Royals. They then became the Kansas City Kings and in 1985 became the Sacramento Kings. The Kings have almost been relocated four times since their 1980s move to Sacramento. The first attempt was to relocate to Anaheim in 2011. Next, the Sacramento rail yards downtown became a real prospect. The Maloof family backed out of the deal. Virginia Beach then tried to lure the Kings away from Sacramento. Seattle was the well-covered move opportunity in 2013. The deal was called off when a Bay Area businessman purchased the team and kept them in Sacramento. The Kings were sold for over $500 million in 2013. The Kings mascot is a lion named Slamson. You will often see him at games and at city events. Sacramento is located 90 miles northeast of San Francisco and 100 miles southwest of Lake Tahoe, providing locals with both active city adventures and natural beauty within driving distance. Currently, Sacramento is home to 470,000 residents in the official city of Sacramento, along with 1.9 million in the surrounding towns, cities, and counties. Sacramento’s climate is considered to be Mediterranean. We enjoy mild temperatures with plenty of sunshine. Unfortunately, this can also mean a heat wave in summer months. In Sacramento alone you will find the Sacramento Ballet, Sacramento Opera, Sacramento Theatre Company, and California Musical Theater. The latter hosts Broadway touring companies whenever they come to town. The Sacramento region is also home to over 30 theaters, museums and more. The Second Saturday Art Walk exists to promote these grassroots arts groups. Many nightclubs exist all over Sacramento, including line dancing, swing dancing, hip-hop, and good old fashioned rock and roll.